This document shows where to find the error tables in two common CenturyLink modems. The error reports help to determine whether there could be an in-house wiring problem (near-end errors), or whether it is CenturyLink not getting the signal to the modem (far-end errors). To connect to the modem, use a computer wired to the modem using Ethernet, and open a browser. Type http://192.168.0.1 into the URL field and click enter/return on the keyboard. Log in with the Admin credentials on the sticker on the underside of the modem. 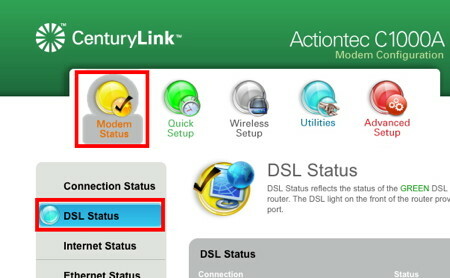 Click on the Modem Status Icon. Then click on DSL Status in the navigation in the left panel. The error report appears like the screenshot below. Usually the errors must read in the tens of thousands to cause a notable effect in connectivity. Click on the Modem Status Icon. 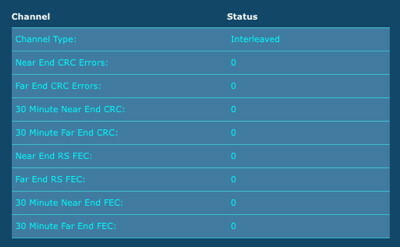 Then click on WAN Status in the navigation panel on the left. The error reports appear. Note any number in the tens of thousands, and whether it appears as a Near End or a Far End error.